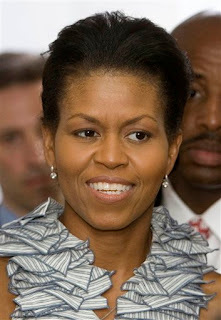 Michelle Obama will be a guest host on "The View" on ABC, Wednesday, June 18. The wife of U.S. Senator and 2008 Democratic Presidential candidate Barack Obama will join the co-hosts as a special guest co-host live on The View! And according to her husband, she's got what it takes! On Senator Obama's recent appearance on The View, he told the ladies that Michelle should appear on the show because she'd "really dish the dirt." Well now it's happening! She's making her first appearance ever on The View. And since her husband has said he has the votes to be the first African-American Democratic Presidential nominee, we're sure there will be a lot to discuss! What will the potential First Lady have to say? Tune in to find out. O wow, I can't wait for this!!! I will definitely be tuning in!